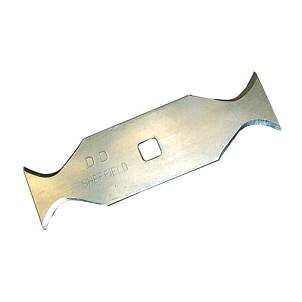 PRODUCT: Talon Bow-Tie Type Replacement Blades. Super Sharp Hardened Carbon Steel. Ideal for Roofing Shingles. 100/Pack (20 packs of 5). Price/Pack. APPLICATIONS: These long lasting blades easily cut linoleum, flooring, roofing shingles etc. Made from the toughest tempered steel with 4 sharp sides for many clean cuts. They fit bow-tie design utility knives.